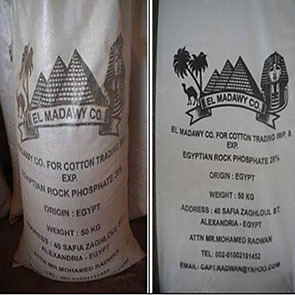 It is our Pleasure to introduce our selves as one of the biggest companies in Egypt have many activities one of them specialized in exporting rock Phosphate. We established the rock phosphate export branch from many years ago, also we the marketing agent for one of the important governmental mining which produce about one million Mt per year grade from P2O5 22% 24% 27% 28% 29% 30% 31% in 50 Bags in containers or in bulk. we guarantee quality & competitive price, our capacity up to 50000 Mt per Shipment.